Lazy Bee Scripts | Damian Trasler's Secret Blog - Do Not Read! I don’t have any scripts mentioned in this newsletter, because the new writing is still underway, but there are some great plays, sketches and musical pieces to be found here. As ever, almost everything from this newsletter (and much more) can be found via the Lazy Bee Scripts web site. Murder in Hollywood by Giles Black, a scripted scene (on a film set), leading to a murder, followed by audience interrogation of the suspects, plus a smattering of written clues. Let Sleeping Frogs Die, a fully-scripted murder mystery by Patricia G., which still challenges the audience to work out who killed the wealthy victim, Monsieur le Comte d’Avignon. After the scripted section of Joanne Mercer’s Murder at Rancho Mucho Denaros the audience have the opportunity to interrogate the suspects, and the murder mystery pack even includes a special currency to allow the audience to bribe the cast into revealing additional information! The Wicked Witch & The Magic Shop by William Arnold Ashbrook is a large-cast family show with original songs and opportunities for audience participation (therefore occupying a theatrical space close to British Pantomime). We already have several treatments of Aesop stories on our books, but we felt that Peter Nuttall’s Aesop’s Famous Fables and Twisted Tales was sufficiently different. It’s intended for performance by children or by adults to an audience of children, and ends with an audience participation song, which should be tremendous fun for small children. Nicholas Richards is a teacher (of languages, I think, but specialising in classics). He was looking for a treatment of The Labours Of Heracles and couldn’t find one, so wrote his own as a comedy play with four (optional) songs. Intended for school productions from Year 6 (US Grade 5) upwards. Martin R. Collin manages to tell a sentimental story about an inspirational and much-loved teacher without straying into mawkishness. I Love You When It’s Raining, Roy G Biv is a one-act play with suggestions for a couple of public domain songs. It may be a little late to say It’s Christmas Time!, but Sharon Stace-Smith’s musical nativity play (with scores for 9 songs and 8 pieces of incidental music) will still be available at the end of the year. Sarah Brown gives a knowing treatment of a school class trying to get to grips with the English and Drama syllabus in Shakespeare – It’s All Greek To Me! Opening Doors by Keith Badham is an ensemble piece for a youth theatre company (28 roles played by a minimum of 10 actors). It’s intended for a aimple set with just one prop: a free-standing doorway. The award-winning Call To Duty by Nettie Baskcomb Brown is an even more multi-layered piece, taking the characters through drama rehearsals and console games into a recreation of the trenches of the First World War. We’ve published two new pantomimes by Luke Reilly, both on themes that are not so common in the pantomime canon. There’s The Princess and the Pea, built around the Hans Christian Andersen story and Hickory Dickory Dock, a completely original story, created around some familiar nursery rhyme characters and a wicked spider. A good choice for companies who have already worked through the usual pantomime stories. Peter Pan occupies a unique position in British copyright law, so that we pay half the author’s royalties to Great Ormond Street Hospital on all our derivatives of J M Barrie’s story. The latest one is Peter Pan – A Pantomime by Stephen and Rachel Humphreys – the usual lost boys, pirates and mermaids, but given a pantomime twist with Smee becoming Mrs Smee, Captain Hook’s Nanny. Bob Tucker’s outlaw story is not the usual family show. Robin Hood – An Investigation Into His Life And Times is a short, risqué sort of British panto, something of a parody of the genre, rather than a straight retelling of the story. The Pagan Priests by Jim Pinnock is a farce for a cast of 7 (5M, 2F), set, unusually, in a church sacristy where the Bishop’s attempts to overhaul the management of a parish go drastically off the rails. We’ve published two new one-act comedy plays by Cheryl Barrett, both developed from her own shorter plays. A Matter Of Health and Safety (3M, 4F) is set at a village fete whilst You’ll Suit Just Fine (3M, 1F) is set in a small menswear shop, where Kevin, the new trainee, is trying to come to grips with customer service. Robin Wilson’s Minutes By Air is a short light comedy for a cast of 2M, 3F, set in a meeting awaiting a crucial participant. Croft & Barnett introduce us to Dr Death, a comedy sketch for 2M, set in the surgery of a doctor with a rather unusual approach to pain. Next in the multi-publications category, we have three comedy sketches from Robert Black. The Also-Ran Club (3M, 1F) finds a group of unsuccessful inventors trying to form an organisation. Message For Sophie will resonate – or possibly ring a bell – with those close to mobile phone addicts (1M, 1F). Billy Loves Brenda (1M, 1F) finds the hero trying to explain-away a new tattoo. Finally, we have two new comedies from Cheryl Barrett. Bring Me Sunshine (4M, 2F) was inspired by a real incident – the damage to a statue on Morecambe sea front. Around The Fridge In Eighty Calories is a monologue for a woman who is larger than she thinks she should be. That’s all for now, but, as noted at the start, there’s a cascade of new material coming through. To read these scripts online, go to http://www.lazybeescripts.co.uk and use the “search title” function to bring up the script you’re looking for. Remember, these scripts are free to READ, not free to USE. More new releases from Lazy Bee Scripts! As ever, I’m reprinting the newsletter from Lazy Bee about new scripts on their site because this month it includes one from me: “For Sale – Baby Shoes – Never Worn” , the play I mentioned in this previous post. But there are lots of other great scripts to see on the site, and they’re all FREE TO READ! We’ve published 40 new scripts since our last newsletter, plus revisions of a couple of previous publications. 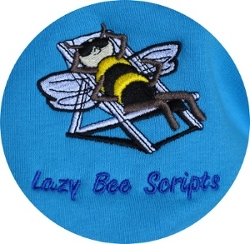 You can find all the scripts (and all the rest of the items detailed in this newsletter) on the Lazy Bee Scripts web site. In Hood – The Sequel, Geoff Bamber imagines (in his usual comic style) what happened to the characters from the Robin Hood legends when Robin had stopped being an outlaw – the sheriff has been deposed, but Prince John is back as King. Simpleton and the Queen Bee is Olivia Arieti’s telling of one of the lesser-known of the Grimm brother’s fairy tales. Caroline Spencer’s Unbitten is a short drama for a secondary school age-group: a vampire allegory. Rings Around The World by Keith Badham has already won awards for its original production. Young Mark is autistic and we are swept into his world in this moving and satirical picture of his short life. Gem and Katy, in different social circles at school, are horrified to discover that their parents are dating. Mary Stone’s short play The Game shows how they tackle the situation. As you might expect from the title, Keep Smiling Through by Suzan Holder is a school play set in Britain during the Second World War, punctuated by the songs of that time. Elsewhere on the junior school history curriculum, we have The Not-So-Vicious Viking by Vic Talecks dramatising the Viking invasion of north-east England. Aaron Warren’s Frank Sent This… is a novel addition to our stock of nativity plays, genuinely funny, despite a serious core, and with the unusual twist of time travel. Toil and Trouble by Karina Fernandez is a one-act comedy, set backstage at a school production of ‘The Scottish Play’. Tensions mount as the young actors ready themselves for the impending curtain up. Who on earth would turn The Hound Of The Baskervilles into a rhyming comedy ‘pantocrime‘? Well, Richard Coleman, obviously. Sticks reasonably well to the original story, give or take humour and verse! Jonathan Caldicot’s The Delphi Dilemma is a one act play for a high school cast, set at an archaeological dig in Greece at which a schoolboy prank goes badly wrong. An Heir for the King by Wesley A. Knoch is a one-act musical (probably for secondary school students or older juniors), portraying rich and poor, generosity and meanness. We try to distinguish between multiple scripts with the same title by using a version number, thus Adrian Barradell’s panto treatment of A Christmas Carol is our Version 2. A large cast piece, as you might expect from Dickens sweep of Victorian London, with 32 roles plus chorus. Similarly, Suzan Holder’s Cinderella is our Version 6. For 18 characters plus chorus. Red Riding Hood [Version 3] comes from Luke Reilly, a modern, edgy retelling of the tale for a cast of 13 plus chorus. Vicky Orman gives us our second version of Robin Hood (although we have plenty of other appearances of Robin Hood with variations on the title). Getting around the version numbering problem with his title, Andrew O’Leary offers Sinbad – The Final Voyage. Traditional in style, though the content of Sinbad stories tends to be more fluid that the core stories of the panto repertoire. There was a race to published two new pantos by Dawn Cairns. Pinocchio (our Version 2) just got his nose in front. The other one is Alice in Pantoland with characters from the Lewis Carroll book plus a few extras on a quest to find who has stolen the jam tarts. Bob Heather and Cheryl Barrett are running a series of pantomime workshops. Their next scheduled event is at the Plaza Theatre in Romsey on August 31st. (They are open for bookings elsewhere and elsewhen.) Meanwhile, they have been shortening some of their longer scripts (because some of them were getting a bit long for modern taste in family shows), so we have recently republished their Snow White and the Seven Dwarfs (our version 4) and Cheryl’s rags-to-Lord-Mayor-of-London Whittington (our Version 7). Nigel Holloway has set a series of comedies amongst the members of the Off-The-Wall Theatre Group. The latest is Blackmailing Butterflies, which sees the company preparing for a production of The Beggar’s Opera, tackling mid-life crises and dealing with an ambitious blackmailer. Sherlock Holmes and the Case of the Vanishing Author is Peter John Cooper’s clever exploration of the relationship between Arthur Conan Doyle and his most famous creation. A cast of 2M, 1F playing multiple roles. According to Jonathan Edgington, We’re All Dead. This is a one act ghostly drama with time shifting between the present day and 1973, and some strong language. More comedy from Michael Pearcy in The Class (1M, 5F) set in a church hall where we join Melanie’s self defence for ladies class, and we wonder about Brian’s interest. We’re not sure where to place Of Edible Houses, Risky Bargains, and Other Grimm Happenings. Steven Stack has created two one-act Grimm adaptations firstly in the form of Hansel and Gretel… and Sadie and secondly Ted. These might be done separately or put together as a full evening’s entertainment. They could be done by kids, or they could be performed by an older company to a family audience. Anyway, the tales are very neatly twisted into off-beat comedy. Impisi by Clive Essame is also difficult to classify. There are 22 named roles, although there could be many more, but in the original professional production, these were all played by two actors. We’re not even sure how long it is. The script itself is short, but it is essential a physical theatre piece, with the actors playing a variety of animals and recreating the African bush with movement and sound. Unusually, we’ve put a link on the web site to a video of extracts from the original production to give a feel for the possibilities of this startling piece of theatre. Having completed his one-act abridgements of all of Shakespeare’s plays, Bill Tordoff has turned his attention to other parts of the 17th century. This time it’s Webster’s turn. A Fifty-Minute Duchess of Malfi cuts John Webster’s original text down to 50 minutes or so. The eponymous heroine is a rich widow. Her brothers – a duke and a cardinal – want control of her wealth and so have forbidden her from marrying. This being Webster, it’s not going to have a happy ending for anyone. A Fifty-Minute White Devil combines politics, power, marriage and murder. This is Grand Guignol; don’t bother to ask who dies, it’s just a matter of where, when and how. The Perfect Couple compare their idyllic marriage with those of their friends in Jonathan Edgington’s comedy sketch (1M, 1F). Telephone (and romantic) etiquette is the theme of The Hang-Up by Helen Gent, a very short sketch for a cast of two, each blessed with a cell-phone. Keith Badham’s Well-Read was probably written for a pair of high school students, but would also be suitable for a slightly older cast (1M, 1F). We’ve published a couple of new comedy sketches by Cheryl Barrett – there’s The Ice Cream Man Cometh (3M), set alongside an ice cream van and First Impressions (2F) set in an (invisible) art gallery. In Biter Bit by Mo Foster, two women sit back-to-back on stage – but they are not in the same place; what they are sharing is a phone call. We have vocal and backing CDs available for An Heir for the King, Wesley Knoch’s new musical play (see above). We’ve added backing tracks (as MP3 files) for two of the pieces for Nigel Holloway’s Blackmailing Butterflies (see above). The show includes a few more musical pieces, for which we supply scores with the Producer’s Copy of the script, but these are intended to be sung unaccompanied.